Is your smile less than perfect? Whether you desire a simple cosmetic dental procedure like teeth whitening or you need a complete mouth makeover, Dr. Thurm can help. Best of all, you can have all of the cosmetic dental services you need completed while you sleep, usually in just one visit. Dr. Thurm has more than 37 years of experience repairing teeth, shaping them, and color-matching so you can have the smile you desire. Dr. Thurm provides cosmetic dental services both with and without sedation. Many of our patients are nervous about going to the dentist, and opt to receive some type of sedation to help them relax. We can even provide general anesthesia to help put the patient completely to sleep. Imagine waking up with a beautiful, new smile! Do you have teeth that are chipped, discolored, or uneven? Dr. Thurm offers porcelain veneers to correct imperfections and restore your smile. A veneer is a thin shell of porcelain that is bonded to the front of the tooth to correct the shape, size or color. It’s an effective way to immediately improve your smile. When you think of a filling, do you think of the old-fashioned, amalgam (silver) fillings? Cosmetic dentistry has come a long way. We use composite fillings that are color-matched to your teeth so they’re practically invisible. Best of all, composite fillings are durable, fracture-resistant, and able to withstand the pressure applied by chewing. If you have a tooth that is too damaged to be treated with a filling but not damaged enough to require a full-coverage crown, then a tooth-colored inlay or onlay may be the best treatment. An inlay refers to the restorative material that fits within the cusps of the tooth. An onlay covers one or more cusps. Both are strong and long-lasting. If you have a chipped tooth, Dr. Thurm can repair it with dental bonding. Bonding uses tooth-colored materials to replace the part of the tooth that is missing. Bonding can also be used to repair irregular spacing between two teeth. Many of our patients have gone years without visiting a dentist and may have severe decay or even missing teeth. If the damage to the tooth is too great for a simple filling, then the dentist may need to remove the decay, reshape the tooth, and cap it with a porcelain crown to protect it. Porcelain crowns look just like natural teeth. Crowns can also be used to support a replacement for a missing tooth. Imagine that you’re missing one tooth. The dentist will create a set of three crowns. Two of those crowns will be placed over the healthy teeth on either side of the gap, and the third crown (called a pontic) will sit in-between. Bridges can span more than one missing tooth, too. For example, if you are missing three teeth in a row, Dr. Thurm can create a five-point bridge. Two crowns slide over the healthy teeth on either side to support the three artificial teeth in the middle. Our teeth support the mouth, cheeks and jaw. If even just one tooth is lost, your appearance can change as the surrounding teeth drift out of position. Your jawline changes shape, the lips flatten, the chin protrudes, and wrinkles can increase. Complete dentures, which replace a full row of teeth, and partial dentures, which replace just one or several missing teeth, help restore normal facial proportions, which can help you maintain a younger appearance. 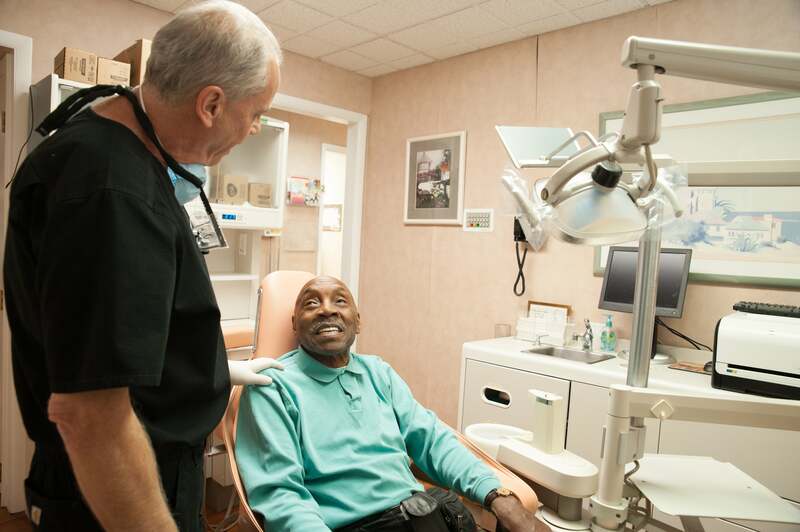 At Thurm Dental, we can use sedation methods including general anesthesia to ensure you are completely comfortable and relaxed as we create a new denture for you. We can even secure the denture to dental implants to ensure it stays in place and doesn’t slip or slide. We also offer in-office teeth whitening that can whiten your teeth up to eight shades in less than an hour! The results can be dramatic. Imagine having a beautiful, bright smile before your next event, business meeting, or dinner date. Even if you haven’t been to the dentist in years, we can restore your smile and your oral health. Call us today at (856) 335-1775 to schedule an appointment. Dr Thurm is New Jersey’s best Dentist and his staff is Wonderful.